Discovered by William Herschel on November 8, 1801. NGC 3077 is a smaller member of the M81 group, located 45' ESE of M81. It looks like an elliptical galaxy, but is peculiar because of two reasons: First, it shows whispy edges and scattered dust clouds similar to M82, probably a result of gravitational interaction with its larger neighbors - similar reason as for M82. This appearance is the reason for classifying at as E2p, p for "peculiar", or irregular of type II. Second, this galaxy has an active nucleus which caused Carl Seyfert in 1943 to include it in his list of galaxies, later called Seyfert Galaxies. However, NGC 3077, though an emission line galaxy, is now no more classified as a Seyfert galaxy. 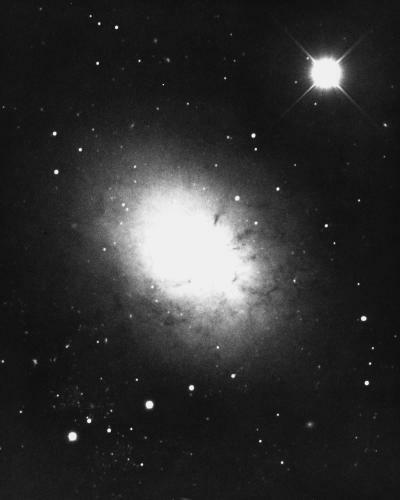 NGC 3077 was discovered, together with NGC 2976 another faint M81 group member, by William Herschel on November 8, 1801, who assigned it the catalog number H I.286. He remarked that "On the nf (NE) side, there is a faint ray interrupting the roundness." Admiral Smyth described it as "A bright-class round nebula; it is a lucid white, and lights up in the centre. .. between these [stars,] the sky is intensely black, and shows the nebula as if floating in awful and illimitable space, at an inconceivable distance." Our image was obtained in 1975 with the 4-meter Mayall telescope at Kitt Peak National Observatory.